There’s a term in engineering called a “1% Solution”. 1% solutions solve a problem that only 1% of the population has. Implied in the term is an excess of effort for the associated reward – if only 1% of people can appreciate what you’ve built, why build it at all? The Happy Hacking Keyboard Professional 2 (HHKB2) is not a keyboard for most people, but for 1% of people, it is the solution to a problem that most people don’t even know exists. When most people first think of a keyboard, they probably think of the one attached to their laptop, or perhaps the one that came included with their desktop. A few people will think of ergonomic keyboards that adopt strange shapes in the name of comfort. Others will think of gaming keyboards that have such features as macro keys and wild RGB backlighting. A yet smaller population will gravitate towards typist-focused mechanical keyboards, the ones that use Cherry MX-type switches. For all of the engineering innovation that has infused keyboard technology over the past 150 years (dating back to 1873, when Christopher Latham Sholes invented the QWERTY keyboard, having previously experimented with a number of other layouts), not much design innovation has accompanied it, especially in the last thirty years. By and large, keyboards from the early days of computers look very much like the keyboards of today (excepting the radical ergonomic designs that come around every now and then). A few buttons have come and gone (goodbye SUPER and META, hello WIN and ALT/OPTION), but you can hand a standard keyboard to most any time traveller from the 70s and they would largely understand what is going on. While alternative keyboard formats such as Dvorak and Colemak have been around since the 1930s, the last two decades have seen an influx of QWERTY based alt formats that try to promote some kind of efficiency without forsaking the prototypical keyboard layout on which most typists learn to type. Among these have been the ascent of so-called 60% keyboards, which seek to shrink the overall size of keyboards without compromising functionality. Some features that are relegated to a secondary function layer in these layouts – the function row, navigation cluster, home/end/delete/insert/pageup/pagedown buttons, and the numpad. The HHKB2 takes the 60% ideal further – how do we achieve some of the ergonomic efficiency of alt keyboards while still retaining a compact and portable form factor? As the name suggests, the HHKB2 is the second in a line of Happy Hacking Keyboards. More accurately, it is actually the fifth: the original Happy Hacking Keyboard, Happy Hacking Keyboard Lite and Lite 2, and Happy Hacking Keyboard Professional all precede the HHKB2. From an ergonomic standpoint, some of these make more sense than others. Moving delete/backspace into row 2 is the best of them. Instead of having to stretch or remove your hand from home row to correct a mistake, you can hit backspace with your pinkie. This is not only more comfortable, but also faster because you don’t have to reset your hands on the home row after making a correction. Truncating the function row, nav cluster, and numpad also make sense from an ergonomic standpoint because it allows your mouse hand to be closer to the centerline of your body. The keyboard itself is less than 12 inches wide, so an offset of 6 to 8 inches for your mouse hand is not inordinate. Displacing Caps Lock from the primary layer also makes a lot of sense – it is rarely used and more trouble than its worth, given that it has such a large key. Finally, from a practical standpoint, I can appreciate the wisdom of shortening the right shift. I use it very rarely (and it’s my understanding that this is the case for most people). However, placing the function key to the right of it exposes a problem that I generally have with the keyboard – its use of bottom row space is inefficient. Whereas standard keyboards have three keys to the left of the spacebar and four to the right, the HHKB has two on each side, an ALT/META and a WIN/SUPER. The only place where Control is accessible is where the caps lock typically resides, and where it would typically reside on the bottom row there is a blank spot on the left, and a printed logo on the right. This seems like a compromise in functionality. While the placement of the Control key makes it much easier to use control in conjunction with keys in row two, it also makes it unreasonable to use control with the rightmost keys in row four without moving your hand. When it comes to row four, I typically will be using CTRL-C and CTRL-V, for copy and paste, respectively. Having to move my hand and reset my hand breaks the efficiency of the maneuver, whereas with a standard layout I am able to use my left pinkie to depress control and my middle or pointer fingers to press C or V. Pressing X, for cut, is even harder because it requires the pointer finger to swing inward of its resting position. The HHKB2 has an ABS plastic case. It is available in dark grey (functionally black) or white. Compared to most keyboards, the build quality is noticeably superior. The seams between the bottom and top halves of the case, while still visible, are finer than the keyboards that come with most computers. Their visibility is a bit accentuated by the fact that effort is made to hide them – the seam runs almost exactly half way between the bottom and top of the keyboard. Usually, manufacturers will try to place the seam along a hidden area of the keyboard, such that even thought it is present, the seam is not visible. Compared to other enthusiast-grade mechanical keyboards (my two references being the Leopold FC750 and Vortex Pok3r), the build quality is middling at best. Not bad, but the others are just quite good. 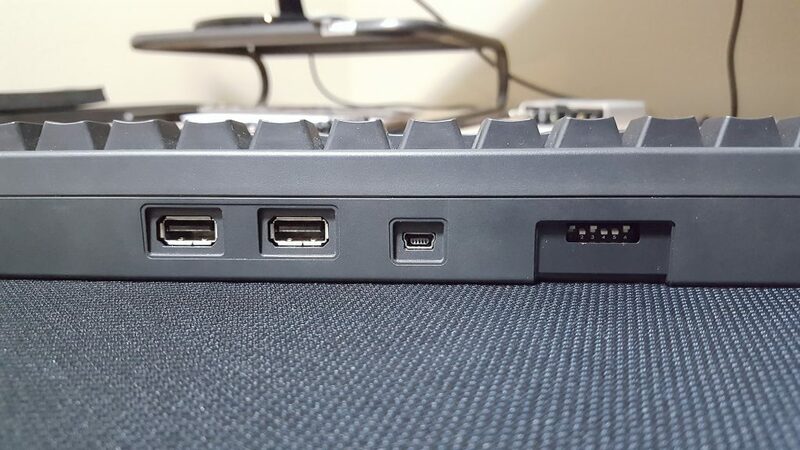 Along with a center-mounted mini-USB out, there are two female USB type B inputs on the front of the keyboard. While these are not substantially powered (200 mA limit), they have come in handy for running a USB numpad or a Logitech mini unifying receiver. I suspect that they may also be able to run older USB drives, but not newer ones that have a higher power draw. These limits aside, keyboards with USB hubs are always appreciated. 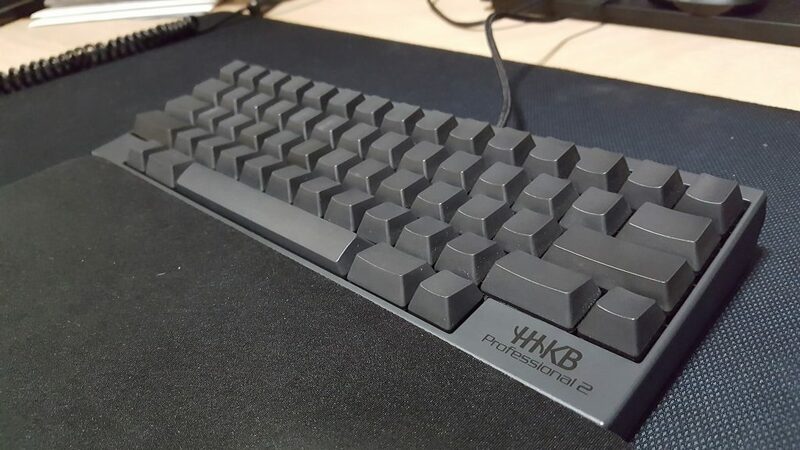 Other than the layout, the HHKB2 is best known for using Topre electrocapacitative switches. These combine a rubber dome with a conductive spring and slider system to provide mechanical-like feedback with each keypress. In my experience, people either love or hate Topre-type switches. The ones that love it think they’re the best switches ever invented, and those that hate it say they feel like any other mediocre rubber dome keyboard. My take on the switches is that they’re remarkably similar to run-of-the-mill rubber dome keyboards, but with enough feedback to positively affect the experience. They have immediate resistance at the top of the key stroke, and then nearly zero resistance after meeting the actuation point. It is actually quite difficult not to bottom out on the keys when typing with these keys, unlike that which might be the case with Cherry MX Clear, Blue, or Green switches. As a result, the feel is incredibly neutral. You press the button, and it works. There’s no sense that actuating the switch less than fully does anything special. The return action on the switches is also noticeably different from Cherry-type switches. Cherry switches reset linearly after bottoming out, but Topre switches seem to bounce back more quickly. As they return to the top of their actuation range, they emit a satisfying “thock” sound. The sound from bottoming out the switch is actually negligible. The thock can be silenced by placing O-Rings or dental bands at the top of the slider range itself, which results in an exceptionally quiet keyboard. However, the unsilenced Topre switch is already noticeably quieter than a typical rubber dome keyboard, and for me the thock adds an additional degree of feedback. My particular keyboard has blank keycaps. The HHKB is also available with dark grey keycaps with black printing, or white with black printing and light grey modifiers. All keycaps are PBT (which is typically more satisfying to the touch than ABS and does not yellow or shine) except for the spacebar. The quality is adequate, which is fortunate given that replacement Topre-stem keycaps are few and far in between. The denser nature of PBT certainly helps to improve the tone of the thock. Personally, the blank keycaps are a bit of a vanity choice. I’ve always wanted to see what it was like to use them, and this has been an interesting experiment. For most typing needs, I now know that I do not look at the keyboard at all. However, for typing passwords in particular using blank keycaps is a bit hit-or-miss. I never realized how many glances I sneak down at my keyboard when typing passwords, if only for comfort. It is easy enough to type sentences, but the act of typing arbitrary sequences that are not actual words (as is typical of a good password) removes the context and familiarity that touch typing requires. In other words, if you gave me a blank keyboard and asked me to point out any particular key it is likely that I could not do it, but if you show me the home row I can probably type most anything you tell me to. All in all, the HHKB2 is a good experience. As a keyboard, it is incredibly satisfying to type on. The mental vanity of typing on blank keycaps is also a substantial value-add. Some of the departures from a standard layout make a lot of sense (like the backspace/delete key). Some are logical but don’t quite work as well as they ought to (replacing caps lock with control), and finally some (specifically the layout of the bottom row) are inefficient and seem counter to the philosophy of the design. I would recommend the HHKB to anybody looking for something different, especially if they have extensive experience with other mechanical keyboards. 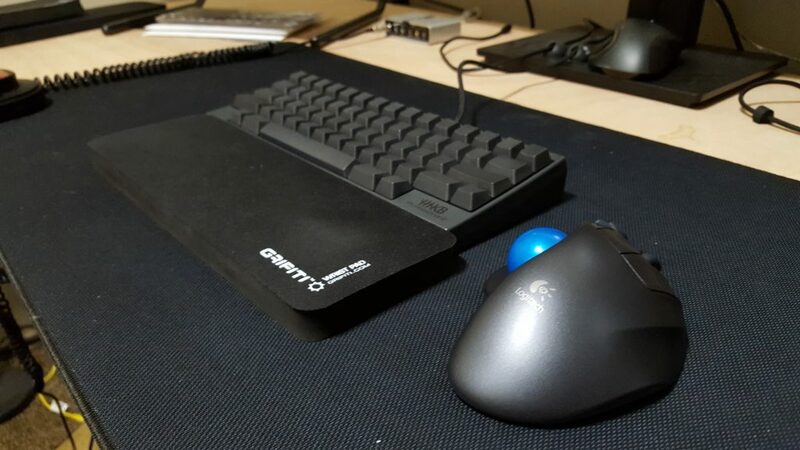 The cost is such that if you don’t have experience with other mechanical keyboards, you’ll probably find yourself questioning the value proposition of what is essentially an extremely refined rubber dome keyboard. However, once you give the layout some thought, and start to think about switch feel, then the value proposition is more straightforward. Chance upon your page and amazed that we both use the same keyboard AND mouse. a great ergonomic solution overall! Is there any big difference compared to Cherry MX Blue? I am using the dasKeyboard for 5 years now and I was thinking of getting the HHKB just for me to try out the Topre Switches. I am a touch typist so I am planning to get the version with a blank keycap. I just would like to know the experience of users who used both. The feel of Topre is MUCH different from MX Blue. Between this and the layout the transition may be quite jarring. I would recommend trying out the switches at the least, if not both, before buying. here is also Leo, Leo2 :-). Thanks for this great review. I have 3 questions and It would be great If you could answer them. I) I am a programmer, working more than 10 hours a day. I am working with IntelliJ or Eclipse. I need the arrows to navigate quickly through the code. How is your experience with arrows? II) I can touch type very fast with QWERTY. But I was thinking about learning DVORAK. But I read it is hard and not comfortable to work with it in the Dvorak layout. Do you have any experience with it? III) I bought a Kinesis Advantage2 QD. It is comfortable and great but it is loud. I am afraid this could be a problem at work and at home. The HHKB has a Type S for silence. It seems to be quite enough to work with at home and at work. 1. I’m not incredibly satisfied with the way directional keys work on this keyboard. I’d prefer WASD style mappings, but this one uses VIM style mapping. Not a problem if you use VIM, but I don’t use VIM very often, and when I do I use directional keys anyway. 2. In my opinion Dvorak is not worth the extra complication. It’s 20% more efficient, maybe, but 50% more work. 3. The normal HHKB is more than quiet enough. Type-S is nice but not a huge improvement. Hi, that is correct, I misspoke. It’s not VIM style. I still prefer WASD, though. Do you have an OEM or swapped orientation space bar? Or is that something aftermarket? It looks really offset (high point up top). It’s flipped! A somewhat common mod, I just took it off flipped it around and put it back on. Does that actually help or feel better to you? Maybe I’ll try it out. Copyright Leo Qin 2018. All opinions are my own.